The leader of the Protectobots, Hotspot, is here to save the day and lead his team in the defense of the innocent! 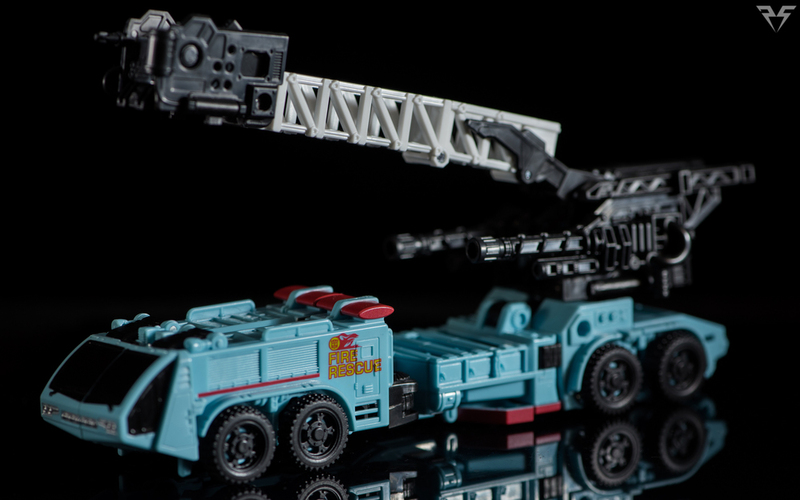 Hotspot’s vehicle mode is a hybrid modern fire engine, quite often similar to the type you’d see at an airport or military facility. He is a very low to the ground and slim vehicle, not your typical brick on wheels that you would normally see. Unlike most airport engines he’s equipped with a ladder that is on a rotating base so it can be positioned to your liking and a small bucket at the end of the ladder that later becomes the combined mode head. He has 6 wheels, 4 on the rear and one set on the front. The plastic color on Hotspot is dead on to the character and looks fantastic. He has some nice deep red detailing on his light bar and a stripe running along the side of this cab. 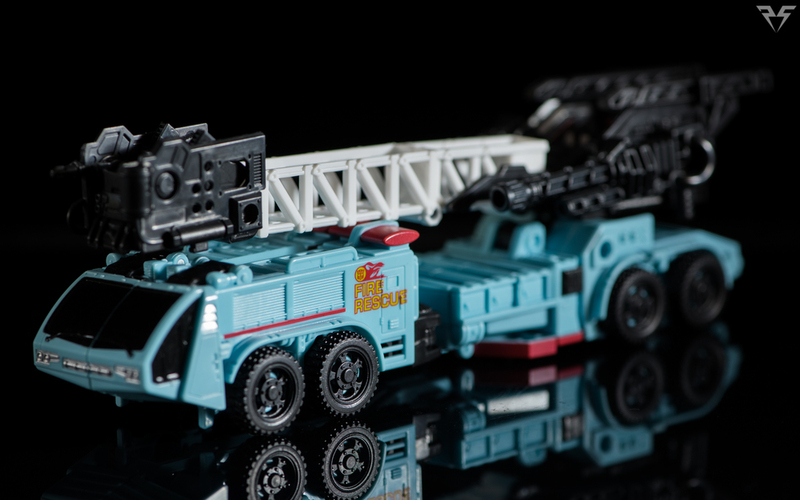 A nice crisp tampograph Autobot logo and the words “Fire Rescue” adorn the rear ½ of the cab. Hotspot looks good in his alt mode though admittedly a little thin in the rear and due to his low stature he’s hardly intimidating to see coming down the road. 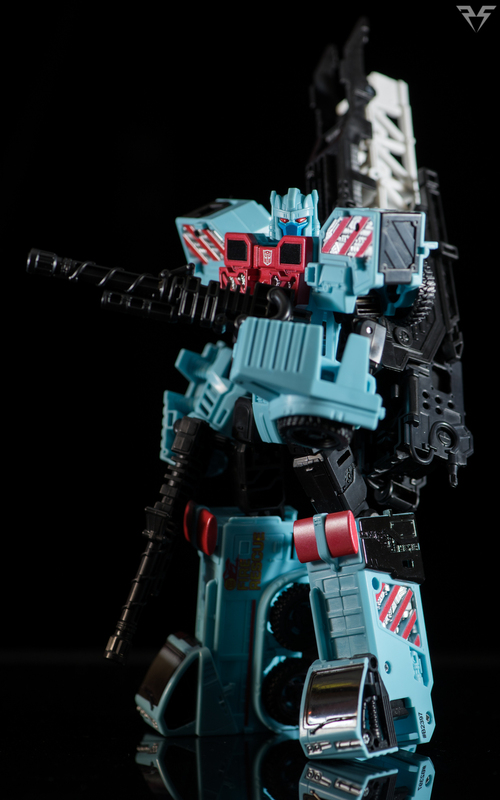 Hotspot’s robot mode is absolutely where this toy shines. He has a fantastic silhouette and really just looks like a fantastic robot toy sitting on the desk. Due to some transformation joints in his shoulders and arms he actually ends up with double elbows, a joint under the elbow allowing him to cross his arms over his chest, and a hinge on the entire shoulder to lift it and the armor up higher. His fists are molded in to large portions of his vehicles rear end, unfortunately this means there is no wrist joint and quite a bit of plastic surrounding his fists. If you want to call it armor or gauntlets maybe that will make you feel better about it. It doesn’t take away from his fantastic aesthetics but it would have been nice if some of the bulk could have folded away. It’s a very similar issue to RID Strong Arm and unfortunately in both cases takes a few points away from an otherwise excellent figure. As fantastic as his range of motion in the arms is, his legs are not nearly as well done. Some owners of Hotspot have mentioned having floppy knees that don’t lock in properly, in most cases this is due to the legs not being locked in properly. There is a double knee joint that needs to be folded (like a Z shape) and clicked in to place in the lower leg below the knee. Once this is completed you will lose the double knee but he should be a lot more stable. Of course this may vary with each individual experience. His feet are flat and really can’t do much, some ankle tilts would have really put this guy over the top. The head sculpt is gorgeous and really well painted. 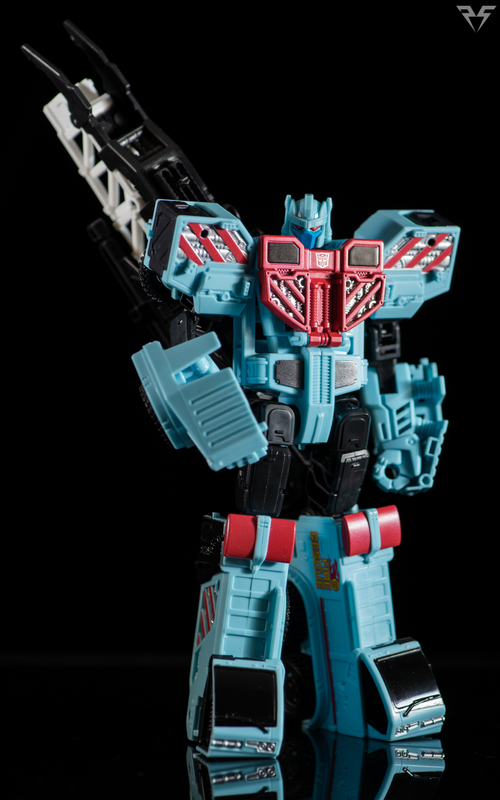 He looks every bit a heroic Autobot with just a bit of a vicious streak. Now of course, there is the elephant in the room, his giant ladder assembly hanging off of his back. The ladder can be rotated to sit on his back pointing in any direction, my preferred being either pointing straight down (this can act as a sort of tripod for provide support in more active poses) or up and at an angle, similar to how a sword would look strapped to someone’s back. If you fiddle with the hinges on the assembly you can even bring the ladder up over his shoulders to form a makeshift cannon weapon. Despite having this large assembly on his back Hotspot is very stable and is easy to balance and find good poses for him to stand in. 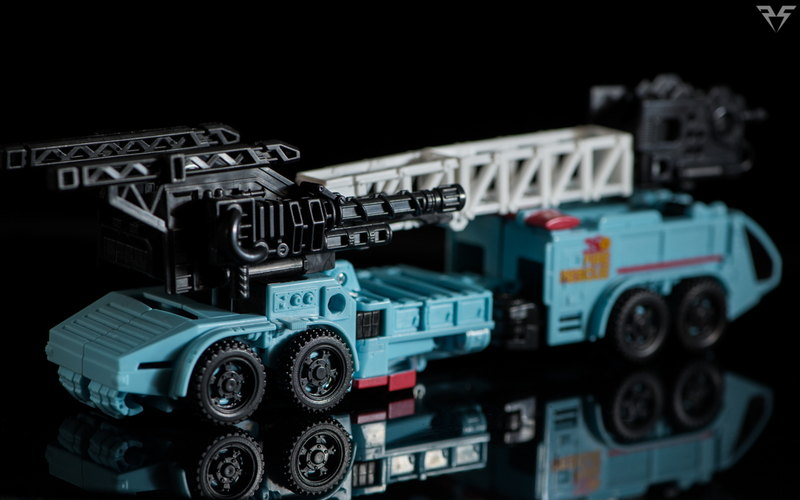 Hotspot comes with his twin Fireball cannon weapons (A fire truck… with fireball cannons… sure that makes sense. I guess he can start fires and then put them out and be the hero? Hmmm…) The pistols are mirrored versions of the same mold, so in each of his hands they have molded detail on one side. The cannons can also be linked end to end to form a longer blaster to be used by the Protectobot’s combined form Defensor. 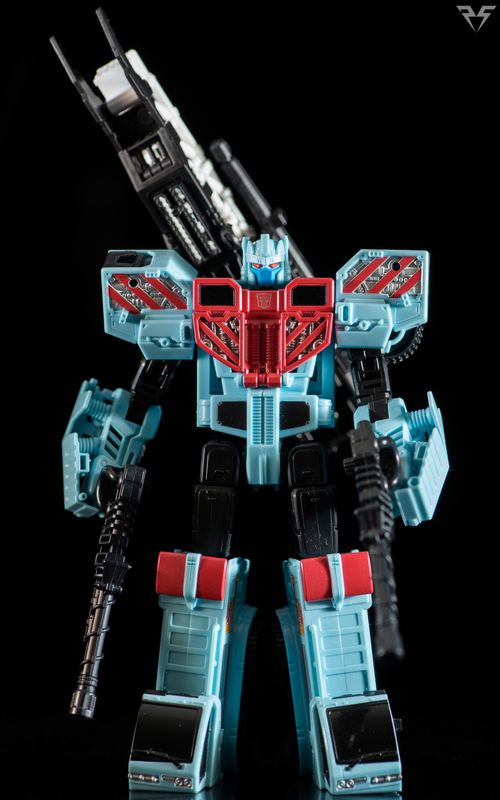 Hotspot is a solid voyager toy that really exemplifies what I love about Combiner Wars. 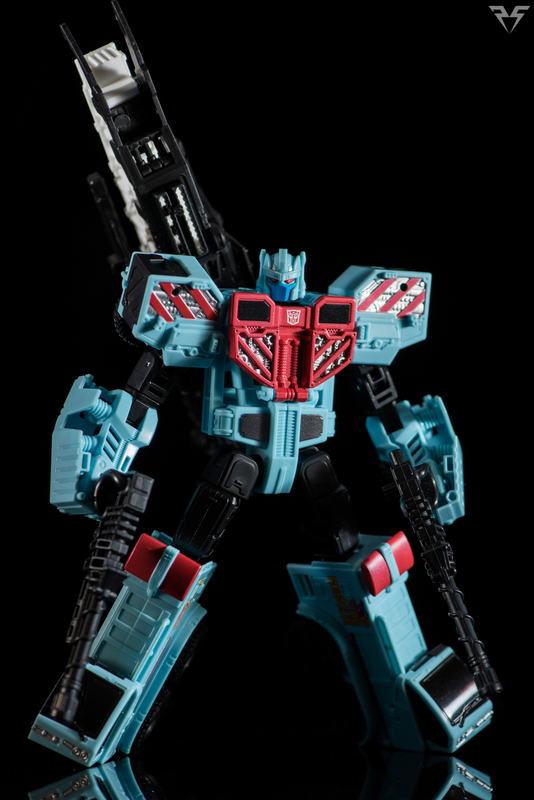 He certainly has his flaws, the addition of a waist joint and ankle tilts for instance would really put him over the top, but I feel he is on par with Silverbolt and is an excellent Combiner Wars voyager figure and forms a fantastic torso mode for Defensor. 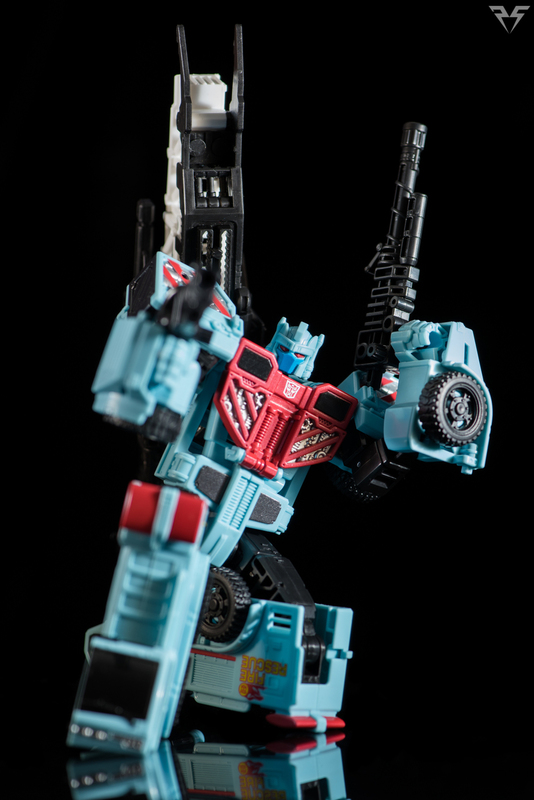 Speaking of Defensor, I’m plugging away on him as we speak so expect a review shortly! Keep your optics locked to Kuma Style and Plastic Spark Photography for updates! Check us out on Facebook to keep up with all the latest news, reviews and photography!